Product code: 550G Categories: 4-Stroke Power Tools, CLEARANCE, CLEARANCE / SALE ITEMS, Garden Power Tools. Spare your back and give your lawn borders that professionally-finished look with this high-performance wheeled lawn-edger from MTD. 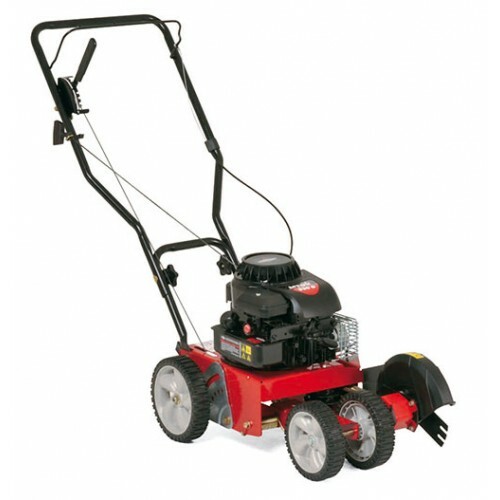 Its 23cm triple-tipped steel blade is driven by a powerful 148cc four-stroke motor from world-leading small-engine experts Briggs & Stratton, so fuel-efficiency; a long life; and headache-free starting are all assured. Power is sent via a belt-drive, which ensures the shock from any accidental impact will be easily absorbed. The LB 553S is a reliable, robust BioClip machine, designed for tough, professional use. The design has focused on achieving the best possible ergonomic conditions for the operator, and good cutting results, even in wet weather. The handle and the steering mechanism are effectively vibration dampened and the central cutting height adjustment is spring loaded to make adjustment as easy as possible. The LB 553S is self propelling, with front-wheel drive for optimal handling. Light-weight wheels of aluminium, with double ball bearings and rubber tyres. Husqvarna have designed a range of leaf blowers which offer a powerful and easy way to clear your property or desired area. These ergonomic, efficient and easy to use machines are suitable for a range of applications - with many machines available all to suit different specification requirements. As these blowers create low noise they are suitable for use in residential areas. The Husqvarna 580BTS is powered by a 75.6cc X-Torq engine which reduces harmful exhaust emissions by up to 75% and increases fuel efficiency by up to 20%. Featuring effective anti-vibration dampeners which absorbs vibrations so the user is not effected by high vibration levels. With cruise control which allows you to set the speed of the fan to give complete control over the task at hand. 29m / min air flow in housing and 25.7m / min air flow in pipe. The 580BTS blower has been designed with a centrifugal air cleaning system for reduced wear and allows for a longer operating time between filter cleanings. Backed by a manufacturing 2 year commercial warranty. Comes with harness, hip belt and wide shoulder strap to help reduce the load and strain from your back so you can work in comfort.The air filter is a commercial grade meaning you get the best of the best.